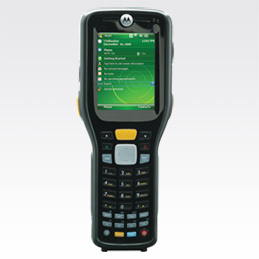 The Motorola FR6000 is built for demanding conditions like warehouses, distribution centers and manufacturing plants. Impact testing across the operating temperature range has been carried out to ensure the FR6000 performs reliably despite inevitable everyday drops. The FR6000 raises the bar for value, with a rugged, compact form factor and low total cost of ownership. The device also features simultaneous voice, data and GPS. This powerhouse packs an unprecedented number of enterprise class features. Users are equipped with a 3G world cell phone, an integrated GPS with superior sensitivity and tracking capabilities, 1D bar code scanner, 3G wireless WAN (WWAN), wireless LAN (WLAN), wireless PAN (WPAN) and IrDA connectivity. Withstands tough use in variety of environments. Lightweight yet rugged, with 1.2m (4 ft) 26 drops per MIL STD 810G. Built for year-round use in nearly any environment. Reliable and cost-effective data connectivity within the enterprise. Wireless connectivity to modems, printers, headsets and more; provides improved security and additional profiles for expanded connectivity to more device types. In order for Bluetooth devices to communicate with one another, they must utilize the same Bluetooth profile. Optimal for scan intensive operations. Vibrate alert mode ideal for noisy environment. Large number of third party applications available on the Windows Mobile platform. Marvell PXA312 624 MHz desktop-like multimedia performance with lower power requirements. Increased interoperability with existing enterprise infrastructure, enhanced security features, more flexible development platform; improved mobile messaging collaboration. Microsoft System Center Mobile Device Manager. Generous memory space to enable robust performance for a wide range of applications. Supports a wide range of value-add location-based services and applications. Allows multiple data input methods to maximize application functionality and serve user preference. Support for Asian language keypads. Versatile - able to use the right mode at the right time. Flexible voice communication options to meet the needs of any business environment. Type II expansion slot is ideal for extending the use of the Motorola FR6000 by enabling third party devices for customized data capture and data communication solutions. The Motorola FR6000 incorporates its own accessory suite and re-uses the MC75 battery and cradle offerings. Provides protection for existing investments. Refer to the FR6000 product brochure for the full specification. The Motorola FR6000 series shares some of the MC70/MC75 accessories such as the single slot cradle.